SUMMARY: Take a look around you in the office. Is everybody exactly the same? Unless you are a penguin, the answer is likely no. As an email marketer, the question then becomes how do I treat different groups of people differently? Read this chart to see which attributes your peers use to segment subscribers. Some people might read the above words and think of the theme song for "The Patty Duke Show." But when the savvy email marketer reads them, she sees a perfect opportunity for email subscriber segmentation of a travel company's list. Q: Can you segment subscriber data into separate lists based on the following attributes? It's been said many times before — relevance equals results. By segmenting your list into different groups, you are more likely, and able, to craft relevant email sends. For example, if you find that one group on your list always clicks on international travel destinations and another group always clicks on promotions and content about domestic destinations, you could split that list and create two different newsletters. This way, everyone gets what they want. Here's another way to segment, as suggested by a business owner in the Benchmark Report survey, "Segmenting lists by recency (date added) and frequency (level of activity) is a great way to generate ideas for new programs. It also gives you a new take on the idea of relevancy. Someone who was just added to the list may find a concept relevant that a frequent email reader does not and vice versa." As the famous saying goes, "The best predictor of future behavior is past behavior." If you know what someone has done, you are more likely to be able to tie into what they will do. Bought a coffee machine? They're likely in the market for coffee. The list could go on. Segmenting by purchase history is an important objective for many marketers, like the email marketing manager who responded that his goal is to "increase engagement while providing more targeted offers to our consumers based on purchase and browse history." For some products, you can't speed up a purchase. You simply have to be top-of-mind once that customer is ready to make that purchase. For example, people tend to get oil changes within a predictable amount of time from when they got the last oil change. For others, nurturing emails are key to moving customers through the sales funnel — for example, answering general industry questions early in the process and specific product questions later in the process. 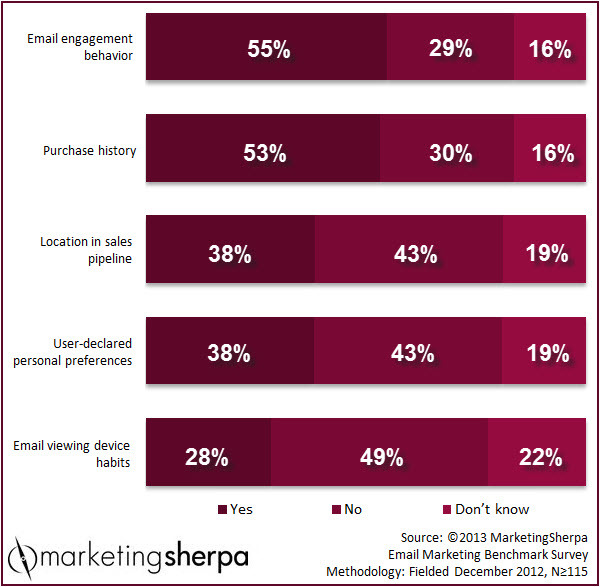 Either way, sales pipeline segmentation can help you deliver relevant, impactful emails, and many marketers are looking to improve their ability to segment by this attribute, such as the marketer who replied, "Looking to improve performance by delivering emails when customer is most likely to purchase and segment the list so that the products offered meet the customer's needs." Measuring behavior can be tricky, so another way to segment is to ask people what information they would like to receive from you. This could be as easy as having separate lists or as complex as having dynamically populated newsletters based on preference centers. One marketer responded that his biggest challenge was "implementing a robust preference center and email automation." His challenge could perhaps be partly because he had "no buy-in from various business groups." Most of the previous types of segmentation focused on what people engage with, buy, need or prefer. This segmentation may seem to focus on how people would like to receive that information. But beyond simply how to display your emails, segmenting by device viewing habits could potentially help influence the question of what as well since the device may change a recipient's behavior. As one email marketing manager said in the Benchmark Report survey, "Based on survey data we have conducted, customers are not in the buying mode when looking at email on their phones, thus our clickthrough rates and conversion rates have gone down. Approximately 40% of all of our opens now occur on mobile devices. Only approximately 3% of those recipients re-open their email on a desktop."